The Twice As Sharp Ookami Gold Package is an ideal setup for sharpening high quality scissors and shears for clients who demand the sharpest, smoothest edge possible. The Ookami Gold Package includes the special 800 grit Diamond Wheel, the Ookami Gold Polishing Wheel and Compound for unmatched polishing, a Fine Ceramic Hone, a Diamond Wheel Cleaning Stick and 3 Practice Shears with a Training DVD. The Convexing Clamp makes it easy to sharpen convex beauty and barber shears. This clamp allows you to set a stopping point, and then to freely rotate from there to the spine. The Twice As Sharp Scissors and Shears Sharpener is designed for the professional sharpener. This sharpener will make sharpening your customer’s shears fast, easy, and precise. A free-floating arm with clamp allows you to accurately sharpen scissors, making them sharper than new. The Twice As Sharp can be set to match all possible angles on any industrial, grooming, and beauty/barber shear up to 14 inches in length. 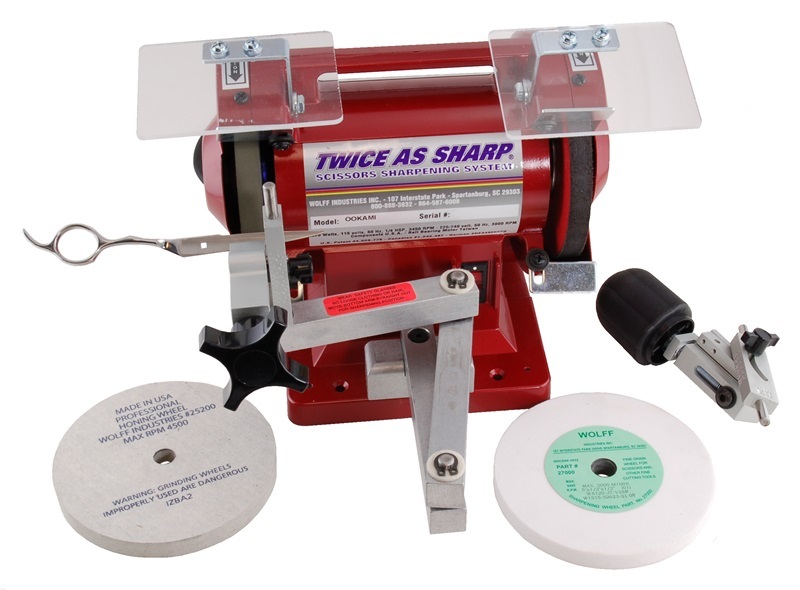 The parts and accessories for the Twice As Sharp are fully interchangeable with the Foley-Belsaw Model 327.